The closet and I have done battle and one of us as emerged victorious. Or something. When I decided I wanted to this the last time, I made sure all the wash was clean and then set out to do battle with this the most evil of closets. That was great, in so far as I got to dig through every garment I own and decide if i should keep it, donate it, store it or toss it. Except for the part where I had to go through all of the clothes that I own. See, i'm not one of those people who wears that sweater way beyond it's usefulness - I'm one of those people who keeps but never wears that sweater way beyond it's usefulness, so my closet was full of clothes I never wore and everything that was dirty was stuff that should have stayed. It took twice as long as it had to and I didn't want to go through that again, so last night when I decided that there was no time like the present to conquor one's demons, I didn't rush down the hall to start doing laundry first - as such, the closet was relatively empty. 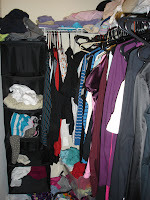 For the number of clothes M and I posess, the closet is really too small. While M wears a regular rotation of 10 t-shirts and 2 pairs of jeans as a newly minted college student, he owns an entire wardrobe of dress pants, suit jackets, ties and dress shirts and they're all hanging limply in the closet. On the shelf above, we store sheets, towels, pj's, M's t-shirts, M's casual pants and my jeans. This seemed like a good idea when we moved it -it bought us more space for things that needed to be hung and it meant that we didn't need a linen closet we don't have. Yay! Except for the part where - uhm, he started doing the laundry and he's not the best folder the world has ever known, so what were neatly organized stacks have become unweildly piles. To boot, instead of taking the whole pile down to get the one item we want, we both tend to pretend we're far more coordinated than we are and just pull. Naturally, this results in the entire stack falling on top of us. Sometimes, we pick it back up. Other times, we get annoyed and leave it on the closet floor. Problem? Yeah. I started with the hanging sweater bins and sorted through that, boxing up a lot of things that aren't in the regular rotation. Once those were nearly empty, I moved on to the hanging clothes. Admittedly, I left his alone. There's nothing wrong with what he has hanging, it all fits him fine and none of it is stained or visually questionable, so it stays as is - but my clothes got a significant pruning. I stashed a lot of long sleeved shirts that I won't have much occasion to wear (and, lets be honest, never really did since I'm all about the light layers) as well as a few items that are stylistically questionable at this juncture and some stuff I just no longer find a need for in my wardrobe. They're things that all have their place and time, but right now isn't it. I also hid a lot of things that don't fit anymore, because staring at clothes you love that you can't wear because you look like a stuffed sausage in them does wonders for your self-esteem, let me tell you. When I went to bed last night, the bedroom was, admittedly, in a state of disarray. 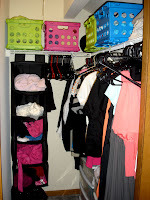 There were three - count 'em, three - bags of neatly folded clothes that needed to be stored sitting on the floor upstairs with another one downstairs and a empty hangers everywhere, but the big empty space in the middle of the closet where clothes had once been? Priceless. This morning, I finished things up and I'm glad that I did. As you can see, the stuff on top of the shelves has now been contained into bins. (The bins that used to store my shoes in the living room, in fact. Now, the shoes are in a pile, but mark my words, they're on the list.) Sheets and towels are in the bins on the short wall, with PJ's, M's t-shirts and (soon - the last bin is currently being used to store bunny paraphernalia, but i'm working on it) M's casual pants. The look, while more than a little "check out my college dorm room" is at least more organized and now he can stop pretending he can fold. The extra hangers are stored on the short wall, for now, but I intend to hang my ever-growing collection of skirts there since they're so easy to lose in the midst of everything on the long wall. As you can see, I didn't ever do much with the sweater keeper beyond take out that which I have no need for. 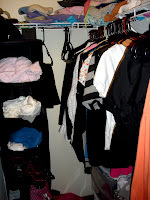 Truth be told, the prospect of folding dozens of cardigans doesn't appeal to me, and since this inexpensive hanging shelf doesn't have hard bottoms, it sags and sweaters get lost. One day I will buy bins or baskets to put in it - or maybe even just cut cardboard inserts for the bottom but, in the mean time, my morning routine is quite happy with the ball-and-shove method I've been using. To me, though, you can't even see the biggest difference - because it happened inside of one of those plastic drawer units that we use to store little things... Mine stores socks and skivvies in one drawer, nylons and tights in another and t-shirts/tank-tops in the top. Oh-My-God do I have a lot of tights :P Once upon a time I had a regular use for pink and black striped nylons...and white and black striped nylons and three kinds of fishnet in three different colors (that's nine pairs for those of you math wizards out there) Now, not so much. So I beat back that collection as well, stashing the stuff that i'll use, just not often enough to justify digging around it every day and what a difference that made to the sheer volume of stuff in that drawer. It's not actually completely done yet. M has been suffering with some dental woes this week and hasn't been able to sleep much, so I can't enact the final phase until he gets out of bed, but once he does - I need to put a few nails into the wall for hanging belts and ties. - a few cubic feet of storage space under the bed. WORST PART: Knowing that it will be a mess again in a few weeks because that's just the kind of people we are.